Yes kids, Santa does live at the North Pole and I have been there. North Pole, Alaska is just outside of Fairbanks–not at the top of the world like you may expect. It does get cold in this winter wonderland–sometimes 60 below and Santa’s house has beautiful displays in both the summer and winter. The theme of the city is ‘Where Christmas Lives Year ‘Round,’ and the residents of the city work hard to make it happen. The first thing you will notice is all the street poles are decorated in red and white and look like candy canes. The streets have names like Santa Claus Lane, Kris Kringle, Snowman Lane, and Donner and Blitzen. Rumor has it that names like Moose Crossing was in the running for the name of the town but a development company settled on North Pole with hopes of drawing a toy manufacturer. That didn’t happen but the name stuck. 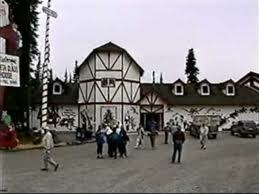 The Santa Claus House opened in 1952. I just had to stop at this place! When I pulled up there is a huge Santa Claus statue out front then a gingerbread-type “house” that holds the spirit of Christmas. As soon as you enter the first sight you see is all of the children’s letters to santa that cover the front entrance and the Christmas music piped overhead. Inside you will find the house laid out in several sections with some very interesting displays of Christmas themed trees and ornaments. Of course everything is for sale. In the middle of the house sits a large chair for Santa himself. He wasn’t in the day of my visit. My guess he was making toys. You can’t help but to be taken back to your childhood as you make your way through the house that is abuzz with tourists and “elves” helping shoppers package up their gifts to send to far off lands. It makes you want to believe that there really is a such thing as Santa Claus and no matter how young or old this place surely helps. While you are there be sure to check out the little cafe that serves homemade fudge, espressos, and of course cookies. You can even write home from the North Pole. I mailed out a couple post cards to family and friends. They will be postmarked from North Pole, Alaska. Previous NaBloPoMo: Are you a better sport as an adult or more competitive than you were as a child?